On October 19, 2017, when Robert Weryk, a Canadian astronomer, turned the Pan-STARRS telescope at the Haleakala observatory in Hawaii towards the Sun, he detected an object moving away from the star. Its peculiar trajectory was immediately studied by astronomers, which resulted in a major discovery: the object was the first to enter the solar system from interstellar space. It was first named ‘Rama’ after the asteroid like interstellar spaceship from ‘Rendezvous with Rama’, one of Arthur C Clarke’s most iconic science fiction novels. But, later it was named as ‘Oumuamua’ in Hawaiian language as the object was first detected from there. Oumuamua roughly translates to the ‘first messenger or scout from the distant past to reach out’. After its detection and naming, astronomers started struggling with its identification and characterisation. At first, it was called an asteroid, but it had non-gravitational acceleration, which meant that something other than gravity was driving it. Then, its reflections, showed that it wasn’t shaped like an asteroid. It was flat and oblong. So, the astronomers moved on to characterising it as a comet, which has non-gravitational acceleration as they release gases and other matter through a phenomenon known as outgassing. But there was no evidence of either a coma or a tail, which Oumuamua should have produced as part of the outgassing process. Even with this major discrepancy, the object continues to be called a comet by most astronomers. What is the origin and identity of Oumuamua? One possibility is that the object is a light-sail floating in interstellar space into which the solar system ran, like a ship bumping into a buoy on ocean surface. A light sail is a sail pushed forward as it reflects light. Indeed, the Spitzer telescope detected no thermal emission from Oumuamua, indicating that its surface is cold and highly reflective. If the reflectivity is high, the inferred size of the object drops from a few hundred meters (which was deduced based on the albedo of rock) to a few tens of meters. It is unclear whether Oumuamua might be defunct technological debris of equipment that is not operational any more or it is functional. Radio observatories failed to detect transmission from it at a power level higher than a tenth of a single cell phone. If Oumuamua originated from a population of similar objects on random trajectories, its discovery requires the production of a thousand trillion such objects per star in the Milky Way. This number exceeds considerably theoretical expectations for asteroids based on a calculation I published with collaborators a decade ago. However, the inferred abundance could be reduced considerably if Oumuamua was on a reconnaissance. The evidence about Oumuamua is not conclusive but interesting. Oumuamua deviates from a trajectory that is solely dictated by the Sun's gravity. This could have been the result of cometary outgassing, but there is no evidence for a cometary tail. Moreover, comets change their spin period and no such change was detected for Oumuamua. The excess acceleration of Oumuamua was detected at multiple times, ruling out an impulsive kick due to a break-up of the object. The only other explanation that comes to mind is the extra force exerted on Oumuamua by sunlight. For it to be effective, Oumuamua needs to be less than a millimeter in thickness, like a sail. This suggested that it may be a light-sail produced by an alien civilisation. I welcome other proposals, but I cannot think of another explanation for its peculiar acceleration. Do we have any idea about where Oumuamua might have originated? We don’t. This is because it appears to be at the Local Standard of Rest of the galaxy which is the average of the motion of all the Earth’s nearby stars. What is so unique about Oumuamua’s trajectory inside our solar system? Oumuamua’s trajectory deviated from that expected based on the Sun’s gravitational force. Such a deviation could be caused through a rocket effect from cometary outgassing (due to the vaporisation of ice by heating from the Sun), but no cometary tail had been seen around Oumuamua. Moreover, cometary outgassing would have produced a variation in its rotation period, which was not detected. If not cometary outgassing, what could be causing the excess acceleration of Oumuamua? We propose that the peculiar acceleration of Oumuamua is caused by the push (not heating) of radiation from the Sun. In order for sunlight to account for the observed acceleration, Oumuamua needs to be less than a millimeter thick but tens of meters in size. A pancake-like geometry was previously suggested to explain the unusual tumbling motion of Oumuamua as it spins. These inferred dimensions are unusual for rocks but we do not know whether Oumuamua is a conventional asteroid or comet since we do not have its image. Our paper shows that a thin object of the required dimensions could survive its journey through the entire Milky Way galaxy unharmed by collisions with atoms or dust particles in interstellar space. We do not know how long its journey had been. What is your view about the reaction of the media to your paper’s findings? I was very surprised about the reaction of the media to our paper. We did not have a press release. The paper was submitted for publication 10 days ago and posted on the online arXiv at the same time. It was reviewed and accepted for publication within a record time of only a few days. We just followed the standard practice of scientific research. What is the way forward from here? Looking ahead, we should search for other interstellar objects in the sky. Such a search would resemble my favourite activity with my daughters when we vacation on a beach, namely examining shells swept ashore from the ocean. Not all shells are the same, and similarly only a fraction of the interstellar objects might be technological debris of alien civilisations. 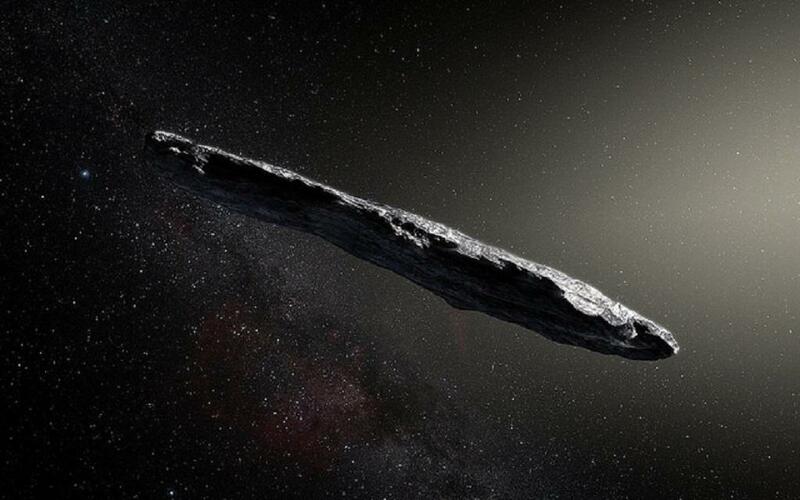 But we should examine anything that enters the solar system from interstellar space to infer the true nature of Oumuamua or other objects of its mysterious population.